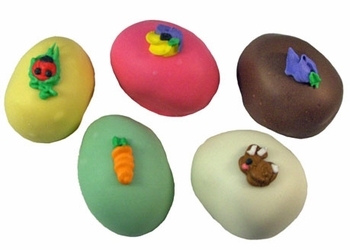 A smaller version of your favorite flavored cream eggs, all hand decorated with assorted Easter icing decorations. Each color egg is a different flavor. Choose from Yellow Coconut Cream, Pink Pecan Cream, Chocolate Cream, Green Vanilla Cream, or White Peanut Butter Cream.